The most flexible way to travel in Costa Rica is, to rent a car. We recommend to rent a 4x4, depends where you travel in Costa Rica you will need it. If you need an offer just let us know, it is a pleasure to organize you a car. 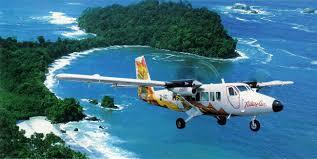 There are two airlines you can choose to Tambor airfield. The flight from San Jose to Tambor takes 20 min and you get a amazing view of the peninsula. From the airfield Tambor, we organize you a taxi or a rental car. It takes a 40 min drive from Tambor to Santa Teresa. Costa Rica is easy to travel by bus. The Peninsula bus it's a easy and cheap way to get from San Jose to Santa Teresa and back. The bus cost $15 and takes 6h. There are two connection per day. Interbus is a option to travel with smaller busses: Interbus.